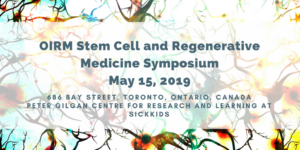 OIRM’s Stem Cell and Regenerative Medicine Symposium is an annual one-day event that brings together scientists, clinicians, trainees, industry, health charities, and government to share advances in the field of regenerative medicine. The Symposium features presentations from some of Ontario’s leading experts, including representatives from OIRM-funded Disease Teams and discovery science presentations highlighting some of Ontario’s most innovative new ideas. This year’s keynote speaker is Dr. Pete Coffey, PhD. from University College London, the agenda will also include talks from OIRM’s Disease Teams, New Ideas and Fellowship awardees. In addition, to two breakout sessions: Making Functional Models of Disease and Trends for the Future: Moving ES/IPS cells into the clinic. Travel support provided to support out of town attendees, register by March 31, 2019 to be considered.